Community leaders are far more highly thought of than other Australian leaders in the areas of trust, competence and public interest, with political leaders at the bottom of the trust ranking, a major new study by the Swinburne Leadership Institute has found. The study found that community leaders are also seen as the most concerned about the wider needs of society and to take a long-term perspective on problems. Community leaders were also judged as the most trustworthy of the five sectors of leaders examined (political, business, union, religious, and community leaders) – with 81 per cent of people thinking community leaders were somewhat or very trustworthy. Political leaders rank below all other categories of leaders –in terms of perceived trust and competence. The findings form part of the inaugural Swinburne Leadership Study, conducted by the Swinburne Leadership Institute, an independent centre of research and advocacy across Government, the private and Not for Profit sectors and civil society. The study found that Australians believe political leaders are motivated by their own interests rather than the greater good, and do not take a long term approach. Only trade union leaders scored worse. 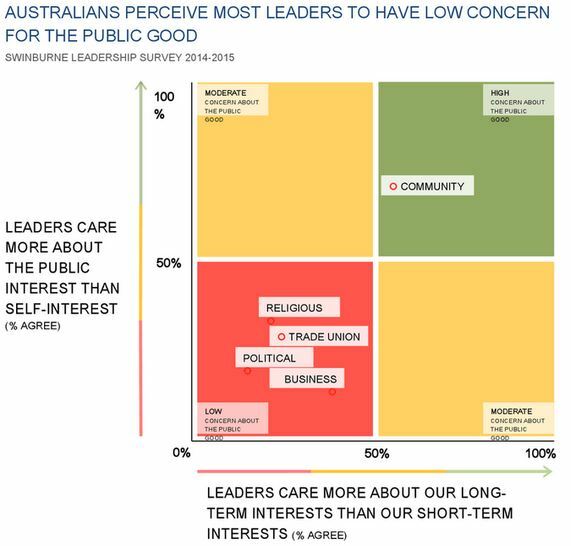 Business leaders were seen as least concerned with the public interest: 75 per cent reported business leaders were somewhat or much more concerned with self interest. Political leaders did not fare much better. Only a quarter of respondents (25 per cent) thought political leaders were more concerned with the public interest than self-interest. Community leaders were perceived as the most concerned with the public interest. Nearly three quarters of respondents (71 per cent) reported community leaders were somewhat or much more concerned with the public interest than self-interest. Only a fifth (21 per cent) thought community leaders were more concerned with self-interest than the public interest. The corresponding figure for religious leaders was more than double (49 per cent). The survey found that Australians also believe political leaders are too little concerned with stewardship of the collective goods upon which the economic and social prosperity depends – economic infrastructure, the environment, community well-being, and democracy – which the survey collectively called “the commons”. Community leaders were thought to care most for future generations. Over half of respondents (52 per cent) reported that community leaders were somewhat or much more concerned with the interests of future generations. The survey found that in general, Australian leaders are regarded as less concerned about the interests of future generations of Australians than they are with those alive in the here and now. “This relative lack of concern for future generations’ interests was especially pronounced when trade union and political leaders were assessed.Two-thirds of respondents (63 per cent) reported trade union leaders were somewhat or much more concerned with the interests of present generations of Australians than future generations. The same result was obtained for political leaders (63 per cent),” the survey said. On the question of the quality of Australian leaders the survey said people clearly differentiate between their ideal and their actual influence. Two-thirds (66 per cent) of Australians report they feel a duty to serve as leaders in their community. Although most Australians engage in civic activities, the survey said these activities tend to be those that require small contributions of time and effort (e.g., donating money to a charity, voting) than large contributions of time and effort (e.g., serving as an office bearer in community/faith-based groups). “This study is groundbreaking in two ways – firstly, it surveys leadership across the whole of society, not just in political terms. 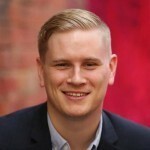 And secondly, it digs behind people’s opinions to reveal why they hold these views, and what kind of leadership Australians want,” Professor John Fien, Executive Director of the Swinburne Leadership Institute said. are maintaining the infrastructure, environmental and social systems – ‘the commons’ – upon which all economic and social development depends. “Our intention is to conduct this survey annually, to measure changes and trends in Australian’s perspectives on leadership,” Professor Fien said. 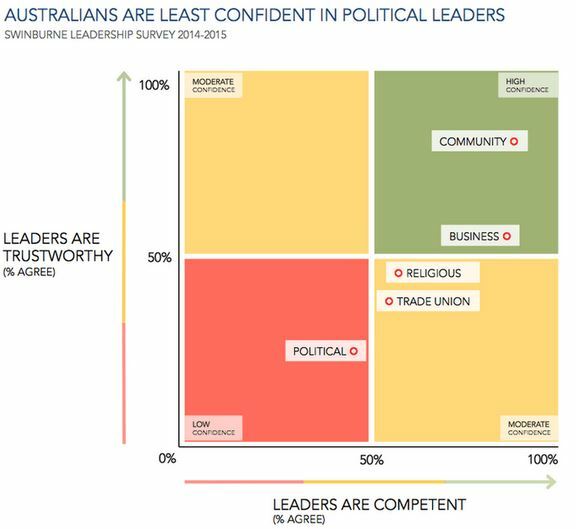 “Australians have nuanced and sophisticated perceptions of the leadership they experience in Australian society. They can and do distinguish between the capabilities of leaders in different sectors, and their expectations of these leaders. This gives added weight to the judgements they make about leadership.